Kawasaki Brute Forum > Brute Forums > Brute Tire & Wheel Combos > 28 inch tires and back spacing?? 28 inch tires and back spacing?? 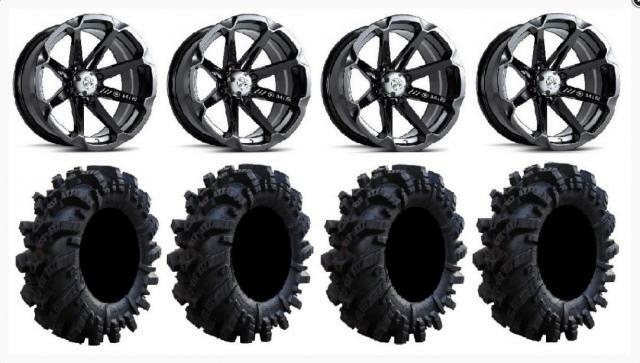 I am looking at installing 28 inch super atv intimidators with 14 inch MSA black diesel wheels. They are 7 inches wide with 4.39 inch back space. Is that good back space or? I want a good stance. Rig has 2 inch highlifter lift. Yeah...that's good. That's 2.16"s out which is a little more then 1.15"s over stock. However...a flat 4+3 would be a little better. I had 5+3s and although I used direction2's over fenders the stability was great. I agree, I think I need 4+3 wheels. What about 4+4? That's an 8" wide wheel..and being 4"s outset it will stick out a lot...and you will need 10-12" wide tires for those...and I don't recommend anything over 10"s on the front. And with a 28" tall tire that "may" be a problem without a lift kit. I ran 9s on my 8" wide wheels and it beat the we-gees out of the wheel's bead lip. Figured it would break a wheel someday and when it did I would go back down to 6 or 7" wheel on the front with the 9" tires.